FCE has been recognised by universities, corporates, organisations and governments in many countries. 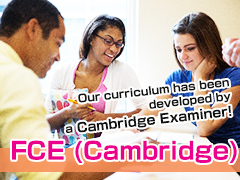 Combined with the Callan Method, our FCE course maximizes your English ability in the most effective way! *Research has found that students reach the level of the Cambridge First Certificate in English (FCE) in about 160 hours with the Callan Method. This course is for intermediate English learners who want to aim at a higher certificate, such as FCE and CAE. Students spend less time and less money on lessons by learning English in a quarter of the time it takes to learn by other methods. *Research has found that students reach the level of the internationally-recognized Cambridge Preliminary English Test (PET) in approximately 80 hours instead of the usual 350 hours it takes when learning by other methods. For Student Visa Holders! 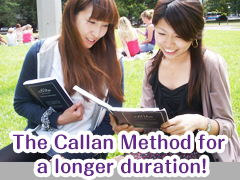 The Callan Method for a longer duration! 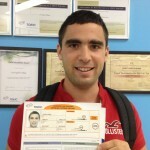 The packaged course that all the student visa holders have been looking for! 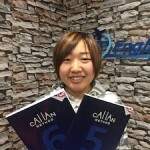 With this new package, you will be able to schedule your study to take the Callan Method for a longer duration, at the same time as they take General English or other courses. In doing so, students can improve their communications skills most effectively! The demand for the Occupational English Test has been dramatically increasing, but still a lot of people do not know much about it. We have heard from people who have taken the test that the OET is more achievable than the IELTS test, but still we hear a lot of questions like "What is the OET anyway?" and "What is the best way to study for the OET?" from people in medical professions. For the answers to these questions and more, we are holding a seminar to introduce and explain the OET and how it can help people in medical professions to achieve their goal of working in Australia. One of our staff who has passed the OET in a single sitting will be able to answer your questions and explain the best tactics to study for the test. If you pass the test you can become registered to work in your profession in Australia. Other than IELTS, the OET has been widely recognised as an English proficiency test that helps in obtaining a nursing license in Australia and New Zealand. If you cannot get the marks you needed in your IELTS test or have had the same score for while, then the OET could be the solution for you. 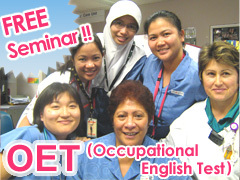 The OET specializes in medical English that you are familiar with, making it much eaiser to achieve the score you want. 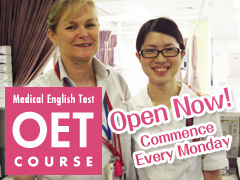 This course is strongly recommended if you want to learn medical English or plan to take the OET test! What are the advantages of studying at night? 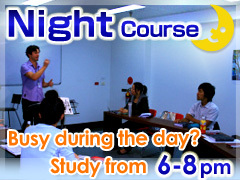 If you wish to study more you can do four nights a week. 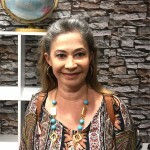 At JET English College, you are prepared for the listening section with one of the most famous and effective ways of teaching, The Callan Method, and simultaneously, you can improve your reading skills with the TOEIC Intensive Course by focusing mostly on each part of the TOEIC Reading Section. 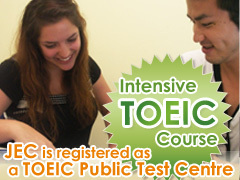 By covering the two sections, you can aim for the highest score in the TOEIC test!